“When is summer going to properly arrive,” people have been moaning over recent weeks. 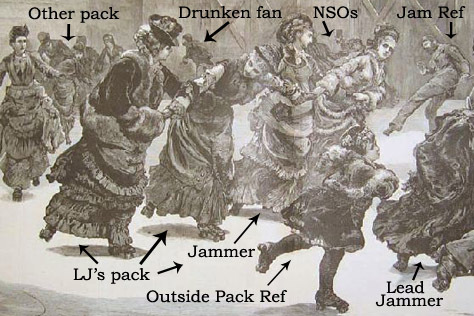 This weekend, as it happens. Not necessarily in weather terms, but in FACT terms. Friday 21st June is officially the first day of summer in 2013 and Saturday 21st September is the last day, so enough of the “it’s supposed to be summer” whining in spring, yeah? Truth be told, we derby fans don’t really like summer anyway as it tends to be the fallow season for derby. Given the age and gender of most combatants, lots of skaters disappear off for holidays with their kids. Yet more – whether students, teachers, tutors or otherwise education sector based – spend much of the gap in the academic year visiting relatives or enjoying the break in other ways. 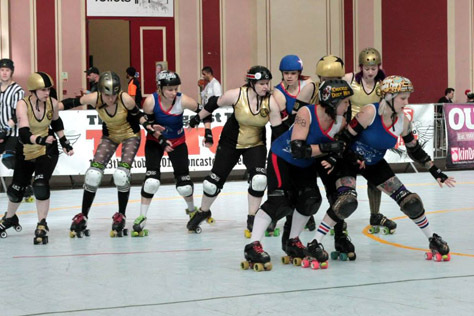 Consequently, many derby leagues take a month or two off, at least in terms of bouting, at that time of year. 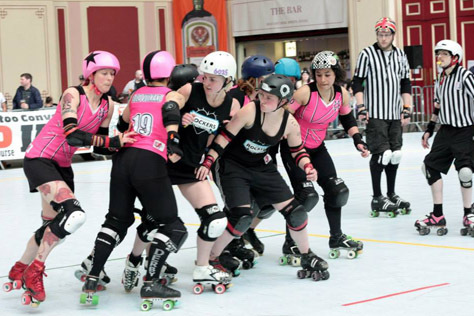 Having said that, don’t let the blank (apart from something that happened in March) Event Calendar page on the Brighton Rockers website fool you; there’s actually plenty of derby action coming up over the summer months. 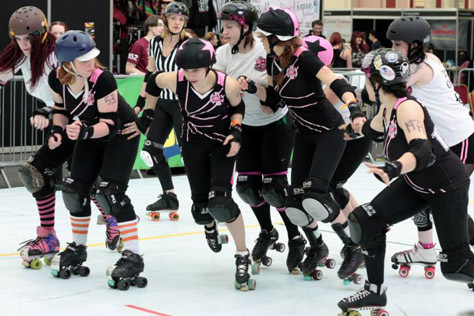 Here we run down some bouts featuring the Rockers A-team, B-team, individual skaters and/or ex-skaters, plus other derby events with a Sussex twist. We’re sure there are several other events out there that should be on this list – we know of at least one bout in Sussex that only doesn’t feature here as there aren’t enough details available yet – so please drop us a line at brightonbrats@yahoo.co.uk if you know of anything else. Also, be aware that some of these events (particularly those towards the end of the list) might be subject to change as derby schedules can be a little, shall we say, ‘fluid’. Cheers. 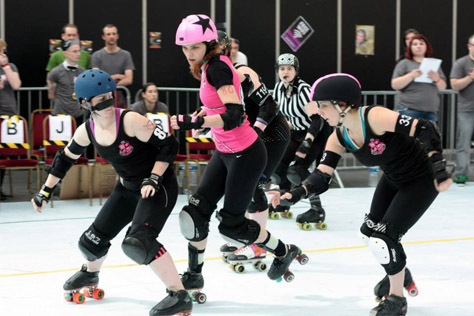 Roller derby is a great force for good in the world, and it’s heartening to see the sport thriving in a location many people perceive through media reports as a divided community riddled with disorder, prejudice, lawlessness and fear, so hats off to the skaters of Croydon. 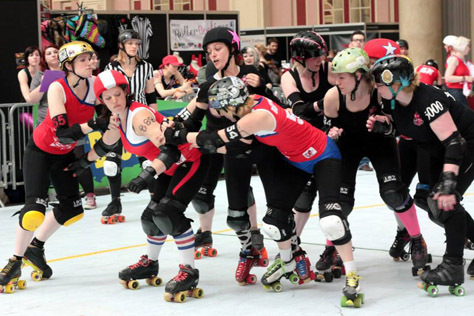 This bout doesn’t feature any Brighton skaters, but there will likely be a smattering of Rockers refs and NSOs involved, along with Brighton superstar/coach Mistress Von Uber Vixen in the role of co-announcer/commentator. The event is also taking place in Brighton’s regular bouting venue, the Dolphin leisure centre in Haywards Heath – Croydon’s usual bouting venue at Monks Hill is currently being rebuilt (despite the rumours, CRD’s Riot Squad didn’t burn it down themselves, it’s a planned upgrade). Doors open at 1pm with first whistle at 1.15, and tickets are great value at £6.50 online until Friday or £7.50 on the door, with an after party in a (fairly) nearby pub to follow. 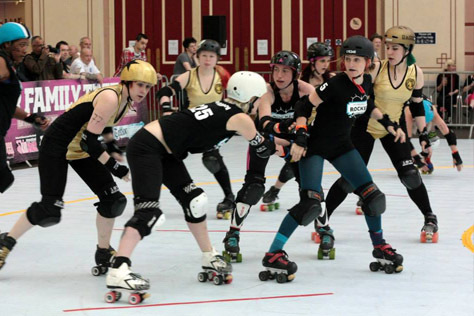 PS Kudos to anyone who, like us, is going to try and take in the London Rockin’ Rollers v Paris 4pm bout in East London too – Haywards to West Ham in 70 mins via weekend public transport is certainly going to be a challenge! Not only does this bout not feature any Rockers on the track, but it’s also in another country. So why is it listed here? Because the fast rising Eastbourne league feature various ex-Brighton B-teamers and freshies in their ranks, and this bout marks only their second public appearance and first international trip. Plus, of course, they’re the Rockers’ East Sussex sisters. So if you happen to find yourself in the French bit of Belgium this particular weekend, get yourself down to the Max Audain sports centre in Frameries (on the outskirts of Mons) to show Eastbourne some Sussex derby love. Wooah! An actual Rockers bout. Nominally a B-team one, but given the pretty strong opposition and no-one in the Rockers squad having had a public run-out since the London tattoo show tournament in late May, we’re expecting this Bruisers line-up to contain even more A-team ringers than normal. It’s taking place at the Midlands Roller Arena, which is a fab looking venue normally used for roller hockey, somewhat incongruously located in the grounds of a rural garden centre! There’s easy road access from the M1 etc, but for us public transport types the only option is the hourly 140 bus from Leicester (45 mins journey) to an unmarked bus stop outside a farm 10 minutes up the road! There’s a mixed bout of some sort before the Brighton one, and at least the after party is closer to civilisation, taking place in a pirate themed bar in central Leicester. Still in some ways coming to terms with former star player Rogue Runner’s transfer to London Rollergirls a year ago, the Dolly Rockits currently rank 23rd in the UK and will provide a stern test for the Bruisers, no matter how many A-teamers Brighton sneak into their fourteen. Anyone who can’t make it up to the East Midlands this weekend, will find a wealth of derby taking place just off Eastbourne seafront. Even those who did go to Ashby Parva – and isn’t that the best derby venue location name ever – should be able to shake off the hangover in time to catch most of the second day. 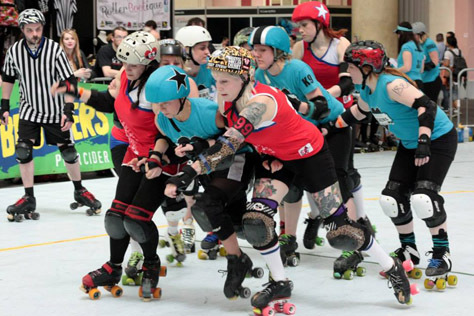 The UK’s only free outdoor roller derby tournament, now in its second year, is hosted by the Bourne Bombshells, who will be facing off on the Saturday against Surrey, Basingstoke and a debutant B-team from Mean Valley (Bedford/Peterborough). The Sunday features an upper bracket of Croydon, Portsmouth, Big Bucks (Wycombe) and Kent. Teams will play one 30-minute period against each of their three opponents, with the day’s top two facing off in a 5pm final. There are other events, including after parties and a roller disco in a Napoleonic fortress, over the course of the weekend. Derby-tastic! 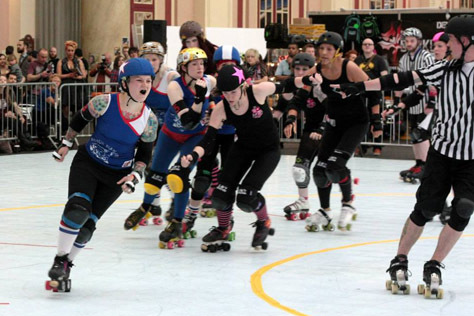 The Royal Windsor Rollergirls are innovative sorts. We caught an intraleague bout of theirs a week or two back where they operated a queuing system for line-ups which meant all players getting (more or less) the same amount of track time. 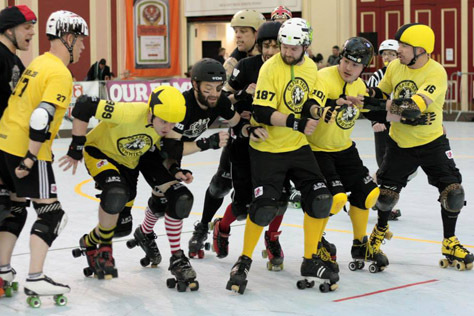 One of their biggest innovations is Sur5al, a frantic full-day derby tournament featuring 15 teams of five who play one full-length two minute jam against each of their 14 opponents. There are no subs or replacements, so if players get injured or expelled for seven penalty box visits that team is down in numbers for the rest of the tournament (some teams have been left with only one player!). This particular ‘remix’ version adds the extra innovation of mixed gender teams, three women and two men per side. Given there are only about a dozen bouting men’s leagues in the UK (compared to 200-odd women’s) the guys have been much sought after. Indeed the 2012 European men’s champions, London-based Southern Discomfort, have provided players for more than half of these 15 sides! Brighton interest comes via the Rollin’ Rockers team which features Brighton superstar The Mighty Mighty Bash alongside Rockers ref Noise Tank; bolstered by Bash’s England team mate Jack Attack and derby power couple Betty Swollox and Piston Broke, this looks on paper like one of the strongest teams taking part. The Eastbourne league is also represented, with head coach Toxic Block Syndrome, Bullet Bomber and The PhilosoFear (who provides most of the photos for this website and our fanzine) featuring for the Foxy Morons. Eek! Not just a Rockers bout, but an A-team bout and in Sussex to boot! 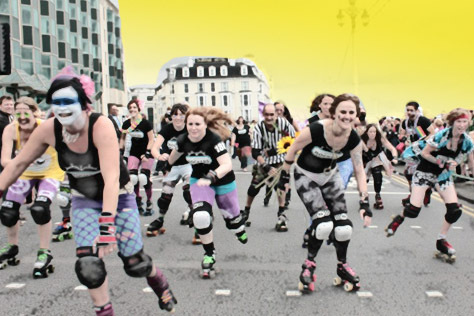 Last we heard Brighton were still hoping to arrange another home bout prior to this one, but if that doesn’t come off this will be their first outing back in Sussex since the March double-header v the London Rockin’ Rollers and Portsmouth Roller Wenches. Brighton, incidentally, haven’t officially confirmed this bout v Leeds on any social media, but Leeds themselves and semi-official UKRDA ranking site flattrackstats.com have both listed it as happening for quite a while now. No more details (eg time, venue) seem available at present, but one thing we can predict is a bruising encounter; with Leeds currently ranked 5th in the UK and home team Brighton 9th, this one should be close. Even tougher opponents look on the cards for the following month – 2nd ranked Auld Reekie have a home bout with Brighton listed for Saturday 26th October (2pm) at the Meadowbank Arena in Edinburgh. We’re getting ahead of ourselves here, though. This preview is only supposed to cover the summer and the Leeds bout is scheduled for the very last day of whatever sort of ‘summer’ we’ll end up with this year. No Facebook event pages yet. Please check the home and away league’s websites, Facebook, Twitter etc closer the time for more confirmation and/or details re these two potential bouts.